Bibliographic Information: Simsa, Marko. Die Zauberflöte [The Magic Flute]. Ills. Doris Eisenburger. Wien-München: Annette Betz Verlag im Verlag Carl Ueberreuter, 2005. Marko Simsa is leading in this picture book the small opera fans through the famous Mozart’s Opera The Magic Flute focusing on the important scenes and arias of this opera. The accompanying CD contains all the musical highlights, the most important dialogues as well as accompanying and explanatory texts. The charming illustrations by Doris Eisenburger introduce the readers directly into a large opera house. This is a picture book of a different art - it introduces the fairy tale plot of Mozart’s famous opera The Magic Flute, but also involves the young readers in an opera house and introduces them to opera music, an art in which Austria has a special place in the world. The book is accompanied by a CD and is interesting and stimulating for an audience of varied age groups. 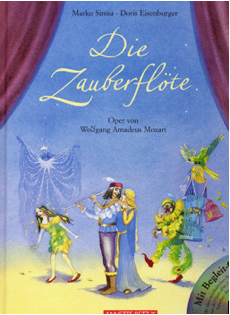 The Magic Flute was among the Top 10 Children’s Books in Austria in 2006.